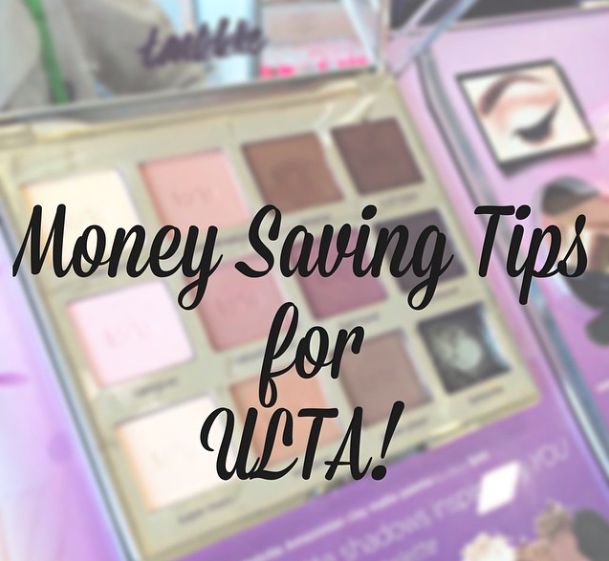 So, if y'all don't know I work at ULTA, and since I've started working there I received questions about shopping at Ulta and such, that I thought I would create a post on ULTA and how to save money when shopping there. Now, all of these tips are ones I learned before EVEN starting to work there [which was the end of August in 2014], as I was always shopping there since discovering the store in the autumn of either 2012/2013. For every dollar spent you receive one point, once you reach one hundred points you receive $3 off your purchase of anything in the store [except salon services]. You can also save up your points for more money off. For example: I'm currently saving my points until I reach 1,000 points as that will give me $50 off. Currently I'm at 600 points which is $20 off a purchase of $20 or more. If you spend $400 within a year, you will become a platinum member. Platinum members receive a extra birthday gift and earn points quicker then regular members. Also sometimes you will receive special deals and gifts with purchases because you are a Platinum member. You will receive double the points during your birthday month. You will also receive a free gift for your birthday as a member, just bring the coupon that will be sent to your email on your Birthday in-store and we will give you your birthday gift. 2. Use Coupons When Shopping -- If you didn't know, there is always a coupon for Ulta on the website for you to use. You can't use two Ulta coupons in the same transaction. For example: You can't stack a $10 off coupon with a $3.50 coupon. You can use your points with any coupons too. A couple of times a year there will be a 20% off coupon that works on fragrances, prestige brands [Urban Decay, Butter London, Tarte, LORAC, Bare Minerals, ect..], and all of the Salon Hair Brands [It's a 10, Living Proof]. Not ALL 20% off coupons do what I just mention above. ^^^^ Some 20% off coupons will still have the same rules as the $3.50 off a purchase of $10 or more coupon. 3. Download the Ulta App -- If you have a smartphone, download the Ulta app and you will always have your coupon handy for purchases. You can also connect your Ulta rewards card and track how many points you have with the app. 4. Keep Track of Sales and Gifts with Purchase Deals -- If there is a certain brand where you are wanting to try out a bunch of products, check Ulta's sale ad to help save more money. Like waiting for a brand to be 40% off, or Buy One Get One 50% off, or even Buy 2 Get 2 Free. Just so you are aware, if you shopping any of these sales [especially when you get products for free] they won't show $0.00 on your receipt when they are rung-up. Instead what Ulta does is divide the cost of the sale product[s] amongst all the qualifying products from the lowest priced item that you bought. Make sense? If you are wanting to try a bunch of items from a higher-end brand, try purchasing when you can receive some deluxe/sample sized products with your purchase after a certain amount. Just a warning, depending on the traffic for your store, they will possibly run out of the gifts near the end of the promotion [or sooner], and the promotion only lasts in-store until they run out of the gifts. 5. Check the Website & Sale Ad for Special Kits -- Often times high-end brands will come out with kits where you can try out a bunch of products for a discounted price. Many times these kits will include a mix of full-sized and deluxe sample sizes, making them a good deal. Most of my higher-end products have been purchased this way. 6. Shop Ulta's 21 Days of Beauty Events -- Twice a year [March & September] Ulta runs this event where a certain product is marked down for one day only for a major sale. This is a excellent time to pick up products from brands like: Bare Minerals, Butter London, Too Faced, Tarte, Urban Decay, etc... as they are sometimes marked down for 50% off [at least a certain product is]. Feel free to pin this!! I think those are all of my tips for shopping at ULTA. If I think of anymore I will just add them to this post with a note. Do YOU have any tips or tricks? Thanks for helping me save some money ahah my wallet thanks you! Totally pinned this to Pinterest!! This is SO useful- can't wait to use these tips in the future as I love Ulta and their coupons! Alway make sure to check your emails before shopping. Ulta frequently sends out special point offers like 2 or 3x the points, sometimes it's 5x the points for being a member for a year or on certain bands or when you buy a fragrance. You do have to activate these deals and they take about 5 minutes to work so make sure to check your emails before you go. I just redeemed 2,200 points and got 4 new eyeshadow palettes for hardly anything!! Oh my gosh this is amazing! & just like Annaliese I am pinning this to Pinterest! I am signed up for Ulta's rewards but I don't shop there often (although I want to) because I'll normally just shop at Target or Sephora. I think you've convinced me to definitely change that for the future! Ulta and I have a special relationship...I reached Platinum status at the end of the year last year, and I'm already up to I think 650 points this year. Thanks for posting these tips, some of them I did not know about! Pinning!! Thank you for the comprehensive tip list!!! I'm so excited to find somewhere that gives better deals than the drugstore I usually get my makeup at. Ulta is by far my favorite cosmetic store! Something I have found helpful is combining Ulta's "Buy 2 get 2 free" sale with the $3.50 coupon. Recently, I was able to stock up on enough concealer for a year by doing this...I ended up paying about $2.50 for each Ulta brand concealer (I only like their stick concealer...not a fan of the liquid version. ).